Turning accidents are a substantial subset of all public transportation accidents and incidents. The handful of principles generally violated in turning accidents is relatively simple. At the same time, many of them would not likely come to mind to someone outside the passenger transportation field. 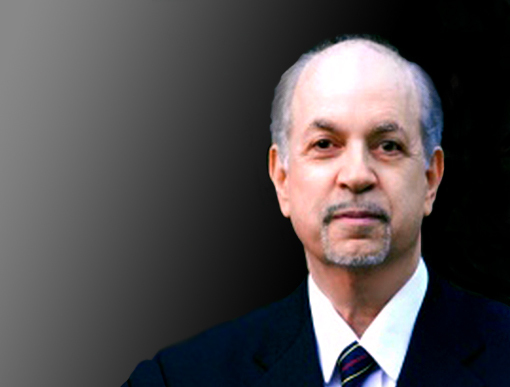 This website focuses on turning accidents, from the perspective of long-time expert witness and consultant Ned Einstein, President of Transportation Alternatives. Not for no reason, many turning accidents involve vehicles with long wheelbases—most commonly schoolbuses (because there are far more of them) and transit buses (because their schedules are almost always too tight). Even with automobiles, more collisions occur at intersections than elsewhere else. But the challenges are much greater with vehicles with long wheelbases, since the path taken by the rear tires—in a proper “square” turn—is not the same as that taken by the front tires. Further complicating turns for long vehicles is the fact that many intersections and their elements (placement of limit lines, sharp right angles of corners, etc.) are not well designed to accommodate turns made by these vehicles. As noted, vehicles with long wheelbases do not turn the same way as those with short wheelbases—or at least should not With a vehicle with a short wheelbase (e.g., automobile, SUV, pickup truck, van), the path that the rear tires takes is largely the same as the path the front tires take. The vehicle should pull forward into the intersection until the rear axle lines up with the “extended curb-line” of the near-side of the intersection. The vehicle should then come to a complete stop (actually required in some states or by some transit districts), or at least slow to a crawl. The driver should then “swing” the nose of the bus as sharply as possible to the right or left and begin moving forward. As this occurs, the vehicle pivots on the left rear tires (for a left turn) or right rear tires (for a right turn), and as the nose of the bus moves forward and around the turn, it drags the rear tires toward it on a diagonal—like the hypotenuse of a right triangle. A bus-length or truck-length or so after the turn, the tail of the vehicle catches up with its nose, and by then, both are generally on the appropriate side of the roadway. From this description, it is easy to see why the failure to make a “square” turn often results in accidents. Part of this stems from the need for the vehicle to come to a complete stop, or close to it, with a proper turn. This gives the driver a chance to look around. So if the driver begins the turn only to find a pedestrian in the vehicle’s path, the vehicle will not be traveling very fast, and will not have traveled very far during the driver’s reaction time, and its braking distance (increasing exponentially with increases in speed) will be short. In contrast, if a large vehicle, instead, makes a “rolling turn,” the nose of the bus will often turn into the oncoming lane of the perpendicular roadway—where it might smash into a vehicle waiting at the limit line of this street if that line is placed close to the intersection. In one turning case in which Ned Einstein served as an expert, the bus’ rear tires ran over the town drunk standing on the corner, as the rear tires rolled up onto the sidewalk. Unfortunately, one can take this shortcut at a much higher speed than that needed to make a proper, “square” turn. And one can usually make a left turn at a much higher speed than a right turn, because the “arc” of a left turn is much broader than that of a right turn. Unless there are at least three perpendicular right lanes to turn into, or the corner is rounded, a long vehicle will spend some time, during a right turn, in the oncoming perpendicular lane or lanes. Turning into a narrow street, so too can a long vehicle making a left turn. But, again, a vehicle can turn left at a much higher speed. This higher speed for an improper rolling left turn is the principal reason there are far more collisions during left turns than during right turns: As a matter of simple math, the higher the speed, the more distance the vehicle will travel during the driver’s reaction time and the vehicle’s braking time. In contrast, when a bus, large truck or motorcoach makes a square left turn into a roadway too narrow to accommodate it, its nose will crash into an object—a store front, a utility pole, etc.—beyond the far-side curb-line of the intersecting street. So to avoid this, drivers of large vehicles “cheat,” beginning their rolling turns long before their vehicles’ rear axles rear the extended curb-line of the near-side of the intersection. But not having to make a square turn (which, again, requires the vehicle to stop or slow to a crawl), long vehicles tend to race through rolling turns. So by the time the driver spots a problem, it is too late to stop to avoid striking it. This “problem” is often a pedestrian in a crosswalk. Particularly when long vehicles turn right into narrow cross-streets, the nose of a bus, coach or truck can remain on the wrong side of the perpendicular street for several seconds, and must often drive down it—on the wrong side of the street for 30 or 50 feet—until the vehicle can swing back into its proper lane on the right side of the street. But this can happen even with left turns, and often do when the streets long vehicles turn into have two or fewer lanes in each direction. Traveling at 5 mph (more typical for a right turn), a full-size bus will travel about 14.6 feet during its two-second reaction time. Then, this 38,000-lb. vehicle must brake to a stop—which it can do in about two feet. So an alert driver turning at this speed need spot a pedestrian in the crosswalk only 17 feet in front to stop before striking him or her. Traveling at 20 mph—as many buses and coaches unfortunately do during rolling left turns—the vehicle will travel almost 59 feet during typical reaction time, and then it will consume another 32 feet before it comes to a complete stop. So to avoid striking the same pedestrian in the crosswalk at this speed, the driver must spot and react to that individual almost 91 feet ahead. (This distance is even greater for a 45-foot motorcoach, with a mass [or, a “gross vehicle weight rating”] of about 54,000 lbs. — compared to a bus with a GVWR of only 38,000 lbs.). Regardless, braking to a quick stop in time to avoid striking a pedestrian in a crosswalk or a vehicle stopped at (or approaching) a limit line too close to the intersection is hard to do when a driver rolls or races through a left turn at even a moderate speed for normal travel. Another basic factor in turning accidents—and a major factor in turning accidents involving vehicles with long wheelbases—is the geometry of a right turn compared to a left turn: Left turns at least give a bus or motorcoach some space. Right turns never give a long vehicle the space to turn into the rightmost lane of the perpendicular street. In fact, unless the right turn is onto a road with at least three lanes to the right, a long vehicle cannot even remain on the same side of the street into which it is turning as it begins its approach into the perpendicular lane. Compared to right turns, most left turns are almost sweeping. Yet the reality is that far more bus and motorcoach accidents occur during left turns (see later section on Road Design). Two other important factors also affect turning. One factor involves how a large vehicle’s driver should move his head around before and during a turn — moving it forward, backwards, and from side-to-side (a technique commonly referred to by transportation professionals as “rock -and-roll”). Another factor that contributes significantly to turning accidents, which TA President Ned Einstein has been arguing for two decades, is the tightness of so many schedules—especially fixed route transit schedules. The relationship between tight schedules and the frequency of left-turning accidents was finally acknowledged, by a transit agency (Seattle METRO) in 2015 (“Metro buses: Pedestrians in a blind spot?” Crosscut). Because we initially think of turns into streets largely in spatial terms, we often underestimate the importance of the temporal factors. As noted, some of these factors—like turning speed, reaction time, and the distances vehicles can travel while drivers are reacting and their vehicles braking—are basic. But far less attention is paid to factors like tight schedules. Some transit systems’ schedules are so tight that drivers routinely turn into crosswalks with pedestrians still in them. They simply hope the pedestrians will hurry along so that their vehicles turn behind pedestrians crossing left-to-right across their windshields, or their vehicles turn in front of pedestrians crossing right-to-left across their windshields. As the arithmetic cited above illustrates, this approach often does not work out. Instead, this practice comprises an outrageous “safety compromise.” And one is likely to find it often on systems whose vehicles make other safety compromises—especially the failure to let boarding passengers take a seat before the bus or coach pulls away from a stop, and no warnings telling them to remain in their seats (or holding onto stanchions) until the vehicle comes to a complete stop. Doing these things 50 or 100 times on a single run, a driver can hope to comply with a tight schedule, and/or perhaps create some much-needed “recovery time” at the end of the run. But this safety compromise places every one of these passengers at risk from the effects of inertial and centrifugal force they experience during acceleration or deceleration/braking. Despite their commonly-tight schedules and multiple safety compromises, transit buses are not the only vehicles involved in turning accidents. 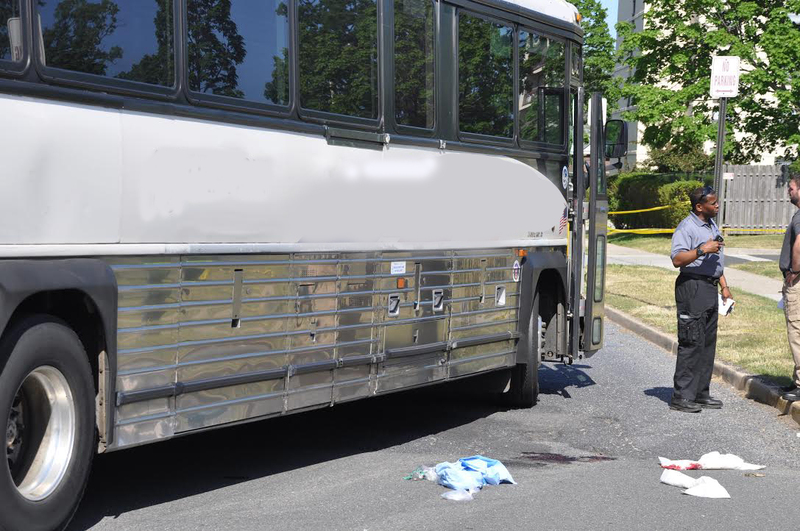 TA President Ned Einstein has been involved in cases where schoolbuses, motorcoaches and even paratransit van- and minibus-conversions have mowed down pedestrians in crosswalks while turning left. Curiously, schoolbus and motorcoach schedules are not usually that tight that a safety compromise like making a rolling turn would often be attempted. In contrast, for a large variety of more complex reasons, paratransit schedules are almost universally too tight. For more on the overarching concept of safety compromises, feel free to navigate to Safety Compromises. Clearly, running over pedestrians in a crosswalk is not the only turning incident scenario. Often, large passenger vehicles turn left in front of oncoming traffic too close to the intersection—instead of waiting for it to clear the intersection before turning. Because the floor heights of buses and motorcoaches are usually about three feet above-ground, and many schoolbuses have virtually no structure below the floor level, cars cut off by these buses prematurely submarine beneath them, occasionally resulting in automobile passengers literally losing their heads, or motorcyclists being smashed into a pile of broken bones and punctured body parts. Numerically, most public transportation incidents do not involve collisions. For example, in schoolbus service, more passengers are killed or severely injured while off the bus (see crossingaccidents.com). But in a turning accident, the math involved lies overwhelmingly in favor of the bus and its passengers, not the pedestrian: As noted, stopping a vehicle of a huge mass becomes exponentially more difficult as its speed increases. Then there is the matter of comparable crash forces. While the precise formula is a bit more exotic, a crude approximation is that crash forces vary inversely with the square of the vehicles’ respective masses. As a consequence, when a 40,000-lb. bus collides with a 4,000-lb. car, the crash forces exerted on the car are not 10 times as great as those experienced by the bus. They are closer to 100 times as great. Most bus, truck or motorcoach drivers mowing down a pedestrian in a crosswalk simply testify that they never saw the victim. In one case where Ned Einstein served as an expert witness, the driver told police arriving on the scene that he did not even notice the four foot-long crack on his own side of the windshield—made when the nose of the bus struck the pedestrian’s head. In most cases, the basic defense is simply the driver lying: “The pedestrian ‘came out of nowhere.’” Once in a blue moon, a driver will testify that he or she saw the pedestrian, but when he or she finally did, it was too late to stop. This revelation is actually close to the truth. But because the arithmetic is so fundamental, and techniques for making proper turns so simple (much less reasonable and prudent), acknowledging this latter phenomenon hardly excuses the driver from making such an error. Sadly, the NYCDOT study failed to point out that this might be a good idea on one-way side streets with a single travel lane, while a poor idea for crossing a major, two-way arterial street with five or six lanes. Further, even some unusual studies validate the challenges of left turns compared to right turns: One study found that older drivers were more than twice as likely to have a crash involving a left-hand turn than while making a right-hand turn (Annals of Emergency Medicine, Volume 35, Issue 6, June 2000, pp. 585–591). Another problem relevant to both left- and right-turning accidents is that the traffic engineer or his or her counterpart in a city or state may have placed the typically white “limit line” too close to the intersection. At un-signalized intersections (particularly where sightlines on both sides of a vehicle approaching the intersection are compromised within a few hundred feet of the intersection), it may be necessary for the limit line to be placed close to the intersection. Particularly with a automobile or “Type C” schoolbus (the ones with the hood), the vehicle’s hood must protrude several feet forward into the intersection before the driver’s seat moves into position where the driver can actually see oncoming vehicles to his or her left or right. But this is not an issue at signalized intersections. Regardless, turning at un-signalized intersections can be challenging and, along with other things, using such streets for buses, trucks or motorcoaches may comprise negligent route design. In contrast, at signalized intersections, the limit line can be placed much further back—perhaps 30 to 50 feet behind the intersection. This is particularly true if the roadway into which the turn will be made is only a two-lane roadway, with one lane in each direction. (Remember the discussion above about how vehicles with long wheelbases must turn.) This is because a turning bus—especially a right-turning bus (see “Dancing in the Oncoming Lane“)—will often spend several seconds in the oncoming lane of the street into which it turns. In addition to these several seconds, the vehicle might occupy the first 40 or 50 feet of this oncoming lane until it can swing back into its appropriate travel lane. So the driver and passengers of a vehicle stopped for a light at a limit lane painted too close to the intersection on a street into which a bus, truck or motorcoach is going to turn are at great risk. This problem is even more exaggerated with most motorcoaches (45 feet long), “articulated” buses (typically 60 feet long), and similarly-sized 18-wheelers. At the same time, the turning speed—or more properly, speeds of the various segments of the turn—are necessarily much slower for right turns, since the arc of the turn is much sharper (and speeding around it could literally cause a roll-over). Regardless, the very challenges of a right turn—especially the need to often spend a few seconds and the first 30 to 50 feet at the end of the turn on the wrong side of the street—makes drivers somewhat cautious. Knowing that one’s large vehicle is almost certain to spend a few moments on the wrong side of the road (with oncoming traffic approaching it, and/or often vehicles poised at a limit line too close to the corner) keeps most right-turning drivers cautious and focused. In contrast, the large arcs of left turns, the much wider space for the turns, and the faux-blind spots much closer to the drivers’ eyes (and even easier to look around) do not evoke the same degree of caution. There are layers and layers of additional intricacies that someone familiar with large vehicle operations should have an instinctive and vast knowledge of—but which someone outside the field would understandably not know about. One such nuance is that a bus, coach or truck cannot turn at a complete right angle—like a zero-turn lawn tractor or motorized wheelchair. During the turn, no matter how sharply the driver “cuts the wheel,” the vehicle must also move some distance forward. This reality is part of the reason narrow side-streets pose problems for vehicles with long wheelbases turning into them: Making proper square turns is impossible, and thus, drivers often cheat by turning prematurely with respect to what their vehicles’ rear drive axles should be aligned with. Another distinction is that, in making a right turn, the bus driver need worry only about (a) vehicles approaching from the left after passing through a red or amber light, (b) oncoming vehicles turning left in front of it (or into its left side), (c) vehicles poised too close to the limit line in the oncoming lanes of the perpendicular roadway, and (d) vehicles approaching the intersection from the right. In contrast, a left-turning vehicle has to worry about (a) vehicles coming from the right (against the light), (b) vehicles turning right from the oncoming lane, and (c) vehicles in the oncoming lane traveling straight through the intersection—on the same green light the bus driver has. And, again, left turns not properly made involve the vehicle traveling at much higher speeds than in right turns. So if left turns are beginning to sound complex and challenging, this is because they are. Another obvious problem with left turns is that the turning vehicle must first find a gap in the perpendicular stream of traffic coming from its left — and then cross that stream in order to enter a gap in traffic also coming toward it from the right. In contrast, a right-turning vehicle need merely shoot into a gap coming from its left side, although as a trade-off, the right-turning vehicle must almost necessarily spend some time on the wrong side of the road it is turning into. (Left-turning long vehicles only have this problem where the perpendicular roadway is narrow.) As a safety matter, particularly during heavy periods of traffic, it would be far more safe to turn right, take the first left turn, drive around the block, and finally make another right turn onto the original roadway one was about to make the left turn onto. This is a far-less-important a tradeoff in a small vehicle which can zip across the roadway, and which does not have a tight schedule whereby the regular failure to comply with it could threaten the driver’s continued employment. Just the same, left turns are full of safety challenges. A few communities have recognized the challenges of left turns. Most famous for this is Detroit, where left turns across major arterial streets are not only illegal, but right-turn “roundabouts” have been integrated into the roadway design: The motorist turns right (far more safely) and, half a block later, turns left between two wide traffic islands, and soon after, simply turns left into the lanes of traffic traveling in the direction the driver wanted to go in the first place. Left turns also trouble traffic engineers—for non-safety-related reasons. Some of the efforts to make left turns more safe increase traffic congestion. So too do cautious drivers who may wait incessantly for a safe opportunity to turn left. Sometimes the answer to these problems is to elongate the length of certain parts of the traffic signal cycle, or to add a “left-turn phase” (or left-turn arrow) to the light cycle. These changes lengthen the entire signal cycle, and add a proportional amount of delay into the traffic flow—adding considerable time to a trip involving multiple intersections with longer signal cycles. It is unlikely that any studies have ever been made of the link between frustration and poor choices about when to turn left. But such enigmas are literally built into public transportation services whose routes have schedules already too tight without these safety-related delays. When schedules are tight, the pressure to take risks increases. Having served as an expert witness in dozens of turning accidents, a tight schedule is the first thing that TA President Ned Einstein looks at. When one considers all these variables, there is a reason bus, truck and motorcoach drivers typically receive six weeks or so of training. Unfortunately, this training has no meaning if it is not (a) understood, (b) retained and (c) applied. When it is not, the risks of turning accidents increase almost exponentially. Just as both right and left turns can be problematic, there are solutions. 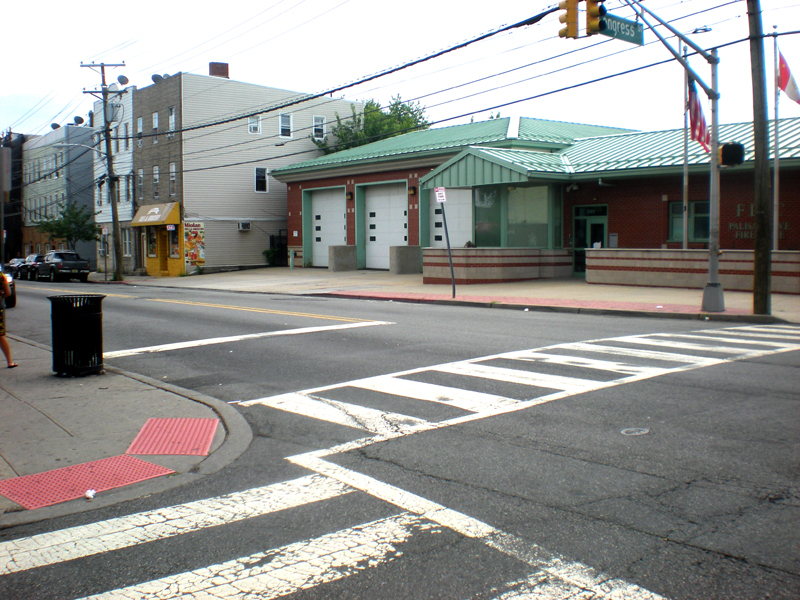 One of the most obvious and least costly is to simply move the “limit line” in front of a signalized intersection back a bus-length or so from the intersection (so that large vehicles turning into these streets don’t crash into the vehicles stopped or poised at limit lines too close to the corner). Another solution would be to route large vehicles largely so that they don’t have to turn into narrow streets, or turn at un-signalized intersections where the perpendicular streets’ limit lines may necessarily be close to the intersection. A third solution would be to round off corners, particularly at un-signalized intersections (and limit lines close to the intersection)—making it much easier for large vehicles to make right turns. These factors —and a few others—are extremely important to attorneys involved in turning cases. To begin with, the driver of a large vehicle (with a mass over 26,000 lbs.) or the driver of a schoolbus of any size must hold a commercial driver’s license (CDL). In addition to proving that this driver can handle a vehicle this size, he or she must be certified in defensive driving. One of the most common faux-defenses employed in turning accidents is the “blind spot ruse”—referencing window posts (known as “A-pillars” in automotive jargon), exterior rear-view mirrors, door posts (for right-turns) and even gizmos (passenger-counting devices, mobile data terminals, etc.) affixed to, or blocking part of, the windshield. This defense is a ruse because drivers are, or should be, taught to bob and weave their heads forwards and backwards, and from side-to-side, before and during all turns, to see around these otherwise blind spots, as noted above. (This technique is commonly referred to as “rock-and-roll”—a catch-phrase chosen in the hope that drivers will remember it.) Properly driven, a bus, coach or truck really has no blind spots. The defendant can occasionally fool a jury with the blind-spot ruse in a right-turn accident, since the blind spots lie further from the driver, and there are more of them (e.g., door post and rubber molding around doors and their edges). In contrast, when a pedestrian or vehicle is struck during a left turn, he or she often spends some time directly in front of the bus, coach or truck’s windshield. Increasingly as video-camera technology is employed (more commonly on transit and schoolbuses than other public transportation vehicles), the object struck is captured on camera—and of the multiple camera views these systems increasingly depict, the universal view they all capture is objects in front of the vehicle. So it is no surprise that these videos are spoliated in a significant percentage of turning cases—if not in a majority of such cases. Compounding this spoliation, few law enforcement officials (and virtually none of any defendants’ management officials) ever “pull the black box.” The exception to this rule occurs mostly in catastrophic motorcoach accidents, where highway patrol officers do. Rarely is the “black box” pulled in any other type of public transportation accidents or incidents. Turning accidents are not simply among the many incident scenarios where the application of defensive driving principles would almost certainly have avoided it. But left-turning accidents might be the poster child for the importance of defensive driving principles—the most fundamental of which is to “Always Expect the Unexpected.” Frankly, finding a vehicle or pedestrian in front of one’s turning bus or coach is a better example of something that is actually expected. For this reason alone, it is easy to build upon the driver’s errors and omissions to find others in the management hierarchy above him or her—most obviously in training and (more importantly) monitoring. When the bus’ schedule is almost always too tight in a turning accident, the ultimate fault lies with the General Manager or Executive Director, who is in charge of policy-making. Proving this is a relatively low-cost exercise for an expert who genuinely understands public transportation, much less its scheduling—much less one who knows every nuance of what everyone in management should be doing, and can write frightening questioning for everyone in the management hierarchy. Naturally, a juror might be somewhat sympathetic to a hapless, often-underpaid driver. But the same sympathy is not usually extended to a $300,000/year General Manager or Executive Director who knows, or should know, every route in the system whose schedule is tight, and every safety compromise made by his or her drivers. This reality illustrates the principle that the closer one examines a case, the more helpful deponents one often finds. Plus, if a genuine expert is engaged, additional codefendants may also be identified. For example, hiring and engaging private contractors is an increasing phenomenon in both the transit field and, even more-so, in the schoolbus field. In the paratransit field, the vast majority of service is provided by contractors. Yet many attorneys file only against the contractor, and fail to grasp the responsibilities of the lead agencies which evaluate and select them, and which should monitor their performance. In fact, non-emergency medical transportation (NEMT) is largely governed by brokers who usually monitor nothing. Yet curiously, while wheelchair tip-overs are commonplace in this sector (largely because the schedules are notoriously too tight), the small vehicles deployed in NEMT service do not translate into many turning accidents. Further, the lead agencies in transit and schoolbus service usually design the routes and schedules (often with routing and scheduling software provided by third-party companies with mandates to make the system as efficient as possible). And lead agencies in paratransit service (which has no “routes”) typically create the schedules (even more obsessively with software). So these lead agencies are (or should be) codefendants almost by the very nature of their roles and responsibilities. Also, neither this software nor lead agency decision-makers ever identify the variables that govern efficiency (see “Principles of Paratransit System Design” as an illustration). As a result, the software merely optimizes the chaos from the lack of system design, for which the lead agencies are always responsible. Otherwise, scheduling software usually provides some theoretical delusion of efficiency by generating schedules that might be efficient only if a driver makes countless safety compromises (as the article about tight schedules which the Seattle METRO data illustrates). But like NEMT service, paratransit vehicles are usually small, and turning accidents in this sector are similarly rare. Just as with crossing accidents (see crossingaccidents.com), turning accidents can sometimes be challenging to the plaintiff in those five states with a one-percent comparative negligence formula (i.e., Virginia, Maryland, Delaware, North Carolina and Alabama). One interesting factor in turning accidents in these states is the direction in which the pedestrian was moving in the crosswalk. For instance, walking toward the oncoming bus in a crosswalk, a pedestrian might at least have a chance to see it a second or two before the collision, even though he or she may not know that the vehicle is intending to turn. Yet even if that pedestrian noticed that the vehicle began turning, it would usually be unrealistic for such an individual to take evasive action in time to avoid the collision. In contrast, a pedestrian crossing to the bus’ right would be approached by the vehicle from his or her rear—where the pedestrian would rarely look over his or her shoulder. As an expert in crossing and turning accidents, TA President Ned Einstein habitually looks over his shoulders when crossing streets, and has done so for decades. As noted, the average pedestrian does not do this. Neither has eyes in back of his or her head. Yet even when the pedestrian is walking toward the turning bus, defending the collision even in a “one-percent state” is not a cinch: Einstein recently helped a crossing victim win $4.5M in a lawsuit in Virginia—a one-percent state. As one can see, there is a lot to know about turning. The good news is that the principles are finite (although only the fundamentals have been presented here): Turning cases are not like med-mal cases or tax cases. So working closely with a genuine expert in public transportation, a prudent attorney can master the subject matter. When he or she does, a plaintiff’s attorney will likely know far more about turning, and far more about many aspects of public transportation, than any of the defendant’s deponents. It is also important to engage an expert in a turning case as early in the case as possible. Producing an extensive set of discovery recommendations almost always means that the plaintiff’s counsel will get stonewalled in his or her initial attempt to get most of it. But his or her expert will be able to give that counsel a detailed explanation of every request, and arm the attorney with information about why each request is material to the case, and why he or she deserves to get it. The best strategy in virtually every turning case is to figure out the case from a combination of extensive discovery and expert exercises. This could entail a riding-and-timing exercise (to determine if the schedule was too tight), an examination of the incident scene and vehicle, and the conduct of a turning exercise at the incident scene — with an exemplary or similar bus, coach or truck of the same size. Then the attorney can use the depositions to settle or win the case—rather than waste them trying to figure it out. This strategy is not always possible. Sometimes a turning case seems obvious, and a plaintiff’s attorney will obtain some discovery, and take a few depositions, in the hope of settling the case without engaging an expert. Most experts understand and accept this. But with a genuine expert in a turning case where errors and/or omissions were made, there is little risk of the plaintiff losing it. In other words, not involving someone darting out from between parked cars at a point where the striking vehicle had no reasonable chance to observe the individual, much less stop in time to avoid striking him or her. So there is little risk of the attorney having to pay the expert’s costs, given the typical structure of a contingent fee arrangement. Instead, postponing this engagement will usually lead to being offered a handful of magic beans in settlement—not nearly what a turning case is usually worth. Plus, engaging an expert too late in the case places the case in “rescue mode.” A good expert can do much in rescue mode. But not nearly as much as when he or she is engaged close to the outset and the logical steps of the case proceed in the most fruitful order. That article also blamed these accidents largely on “blind spots.” Of course, as noted, if a driver properly “rocked-and-rolled” to see around window posts, exterior rear-view mirrors and possible other appendages or windshield blockages, there would be no blind spots. The precise math is more exotic. But this crude rule-of-thumb” provides an excellent illustration of the exponential relationship between mass and crash forces.